EBSCO is experiencing technical difficulties with the eBook collection. If you find that you are having trouble, try using Google Chrome for your browser. The EPUB Full Text book reader seems to be more reliable, so if you have a choice between PDF Full Text and EPUB, choose EPUB. UPDATE: As of 3:30pm CDT, our issues with off-campus access to EBSCOhost have been resolved. You might need to clear your browser’s cache and history to recognize any changes, but please contact us if you are still having trouble. 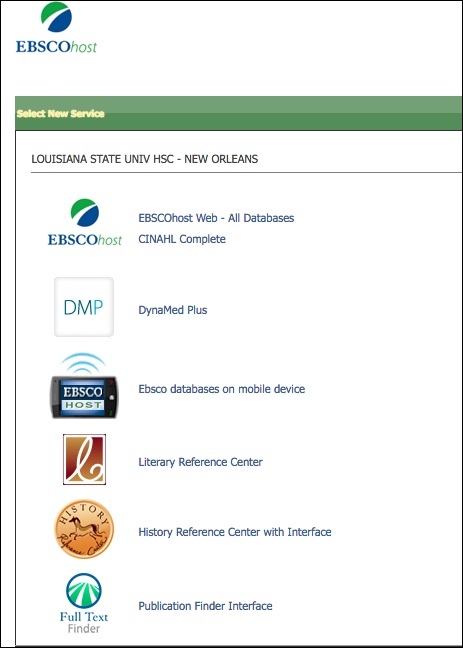 While we are still waiting for our issues with off-campus access to some resources to be resolved, we have come up with a workaround for databases and books available through EBSCOhost. Unfortunately, for our Baton Rouge LSUHSC/OLOL patrons, this workaround will not work while you are on the Baton Rouge campus. It will work, though, at any other location off-campus. We do not have an estimate on when our off-campus issues will be resolved, but if you need any assistance in accessing this or any other Library resources, please do not hesitate to contact us. With the recent switch to EBSCOhost as our provider for HaPI (Health and Psychosocial Instruments), a complication has popped up: if you click the “LSUHSC-NO Check Full Text” icon you will not find a match for the article. This is occurring because there is a problem with the information sent from HaPI to our WebBridge Link Resolver. We will update as soon as this problem is resolved. However, if you need any help with this or any other Library resources, please contact us. Somehow in the summer doldrums, we missed that EBSCO was switching from Lexi-PALS to AHFS Consumer Medication Information. This free database (to EBSCO subscribers) is used to supplement health science databases. ?á AHFS is an acronym for?á?áAmerican Hospital Formulary Service?« and is published by?áthe American Society of Health-System Pharmacists. ?á?á It is updated monthly and information is available in both English and Spanish. 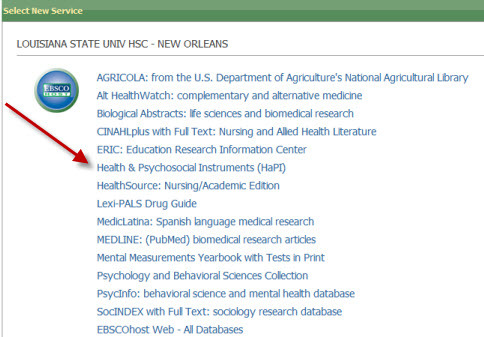 LSUHSC Libraries have had access to HaPI since the fall of 2001 via Ovid, but we switched suppliers on September 1st. EDIT 7:23 PM — Ebscohost is working now. Please call the circulation desk at 504-568-6100 if you continue to have connection issues. 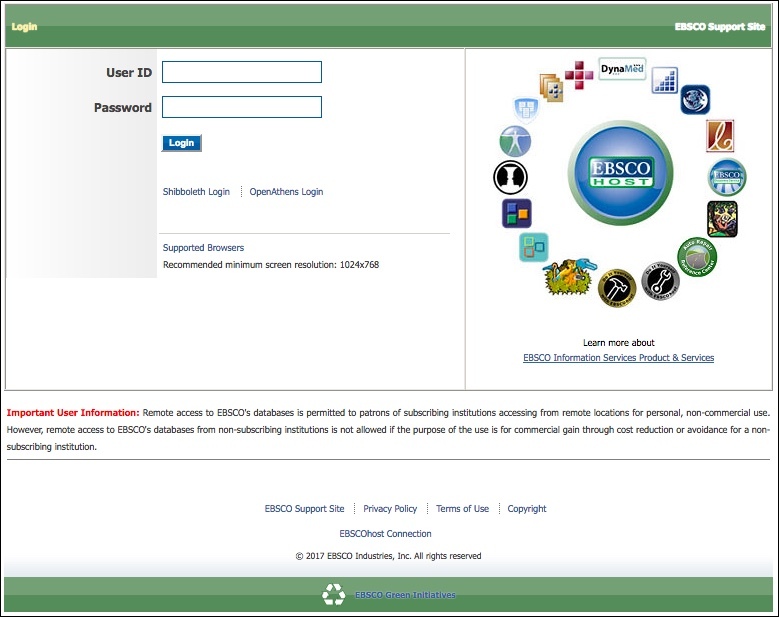 Ebscohost is currently experiencing a problem. If you are tyring to access nursing journals or databases such as CINAHLPlus with full text, they are unavailable. We have been reassured that service to Ebsco will be restored shortly.